Free Printable Bible Books List. Free Printable Bible Books List that you can use to help your kids learn and memorize the 66 Bible books from Old Testament and New Testament. This is a great free printable resource for teachers and parents to use at christian school, homeschooling, church or at home. 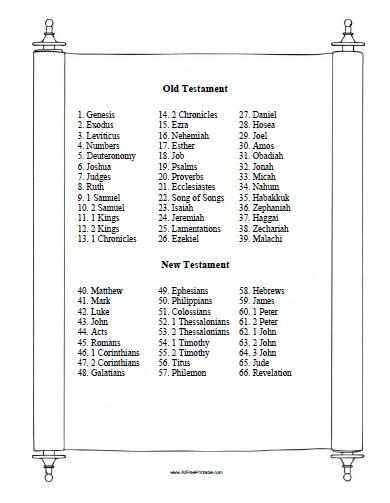 Print this Bible Books List free using your laser or inkjet printer, and put it on a visible place at classroom. You can select from 2 different designs of scroll. Click the link to download or print the Bible Books List free in PDF format.